Oven roasting, which uses moist heat to cook and requires little attention, is ideal for large, thick cuts of beef such as pot roasts that need longer, slower cooking to become moist, tender and flavorful. The section of the cow from which the pot roast is cut dictates, in part, the appropriate cooking temperature. The cooking temperature and other variables, such as the weight of the pot roast, determine the length of cooking time required. Preheat your oven to 325 degrees Fahrenheit for a pot roast from the round; 425 degrees for a pot roast from the chuck; and 350 degrees for a pot roast from the rib. The weight and type of roast determines the cooking time; you should cook a roast until its internal temperature is between 135 and 150 degrees F. For instance, a 2- to 3-lb. rump roast cooks for 1 ½ to 2 hours to medium-rare doneness, the Cattlemen's Beef Board and National Cattlemen's Beef Association website advises. Insert an ovenproof meat thermometer into the thickest part of the roast. Make sure the thermometer tip does not touch bone or rest in a fatty area. If you do not have an ovenproof meat thermometer, you may use an instant-read thermometer. Check the internal temperature of the pot roast after the appropriate cooking time to make sure it is done. If you are using an instant-read thermometer, insert it into the roast near the end of the cooking period, read it after 15 seconds, remove it and return the roast to the oven if necessary. Generally, the final internal temperature, according to the U.S. Department of Agriculture, for a medium-rare pot roast should be around 145 degrees F after 15 to 20 minutes of standing time. The final internal temperature for a medium-done pot roast should be around 160 degrees after 15 to 20 minutes' standing time. Remove the pot roast from the oven when it is 5 to 10 degrees below the recommended final internal temperature. Cover the roasting pan loosely with a tent of aluminum foil and let the roast stand for 15 to 20 minutes. The internal temperature of the roast will rise another 5 to 10 degrees. 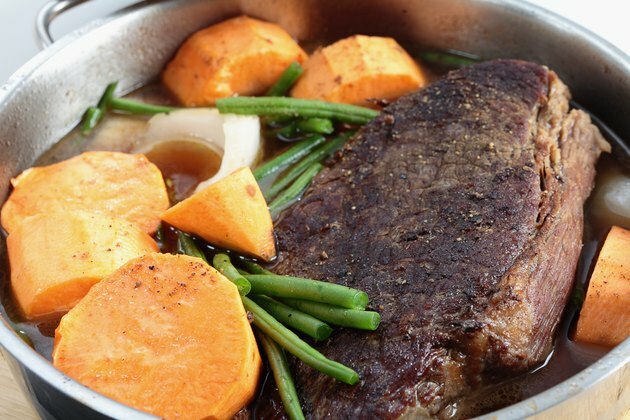 The Cattlemen's Beef Board and National Cattlemen's Beef Association recommends placing the pot roast fat-side up in a shallow pan without added water and roasting it uncovered. Pot roasts cut from the forequarters and hindquarters tend to be less tender. Roasts from the hindquarters, or the round, are called rump roasts. Cuts from the forequarters are called chuck roasts and tend to have more fat and flavor than roasts from the round. Sirloin roasts are cut from the area above the rump.